An unabridged version of Look Homeward, Angel. On original publication 66,000 words were omitted for reasons of propriety and publishing economics, using the carbon copy of the original typescript, the Bruccolis have established the original text. 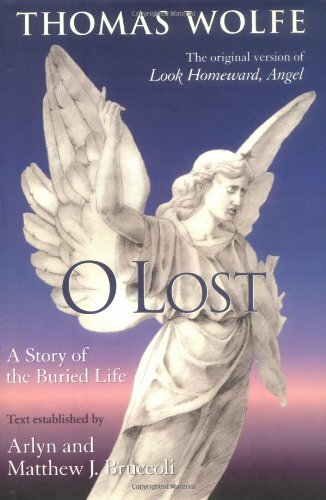 The editing of Thomas Wolfe's first novel, originally titled O Lost, has been the subject of literary argument since its 1929 publication in abridged form as Look Homeward, Angel. This powerful coming-of-age novel tells the rich story of Eugene Gant, a young North Carolina man who longs to escape the confines of his small-town life and his tumultuous family. At the insistence of Maxwell Perkins, the legendary editor at Charles Scribner's Sons, Wolfe cut the typescript by 22 percent. Sixty-six thousand words were omitted for reasons of propriety and publishing economics, as well as to remove material deemed expendable by Perkins. To be published for the first time on October 3, 2000 -- the centenary of Wolfe's birth -- O Lost presents the complete text of the novel's manuscript.For seventy years Wolfe scholars have speculated about the merits of the unpublished complete work and about the editorial process -- particularly the reputed collaboration of Perkins and Wolfe. In order to present this classic novel in its original form as written by Wolfe, the text has been established by Arlyn and Matthew J. Bruccoli from the carbon copy of the typescript and from Wolfe's pencil manuscript. In addition to restoring passages omitted from Look Homeward, Angel, the editors have corrected errors introduced by the typist and other mistakes in the original text and have explicated problematic readings. An introduction and appendixes -- including textual, bibliographical, and explanatory notes -- reconstruct Wolfe's process of creation and place it in the context of the publishing process.